Korgoth Kul retreated deep into forest. The Shrine of Algomarth had long ago been ruins but it still contained the spark of what he needed. Still the Sigmarite forces had concentrated since their desperate attack on the Balegate and they were moving towards him now. If he could hold them off for long enough the Slaughterpriest would perform the ritual and the land would be rife with slaughter again. He moved forward with his legions, the Slaughterpriest would have to take care of the ritual himself. 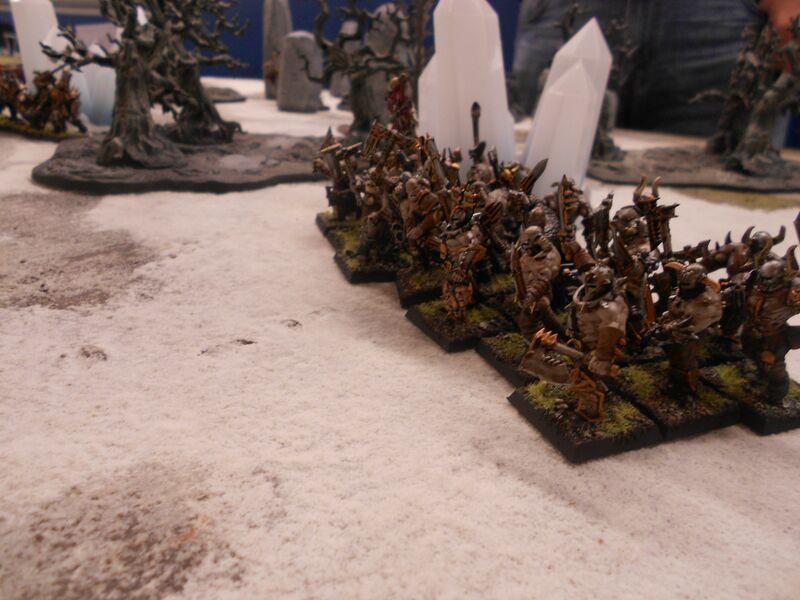 The low guttural chanting could be heard echoing through the woods as the priest invoked the power of Khorne. The Sigmarites emerged from the pine forest into the blasted area around the shrine. The dead trees eerie with the chanting emanating from somewhere behind them. 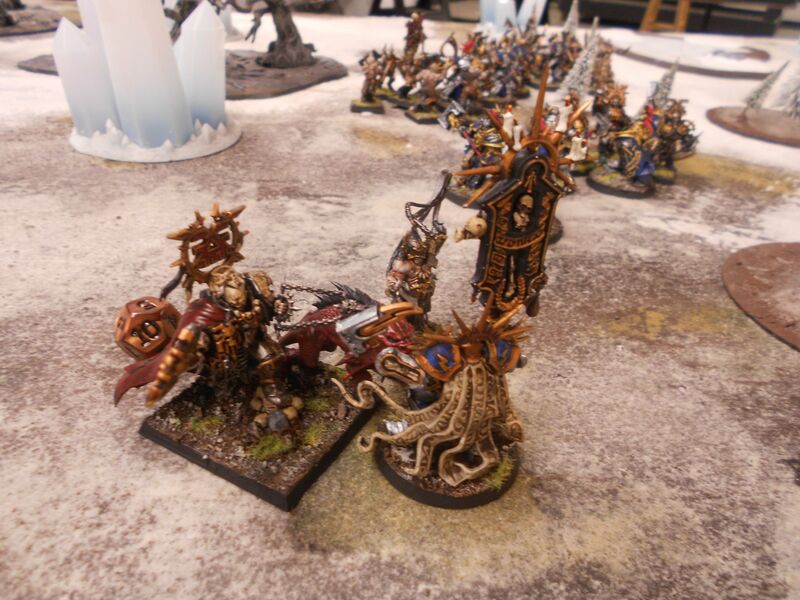 Bhartus left his Judicators on his right to cover his right flank and took most of his force up the left side into the right flank of the Khornate horde. 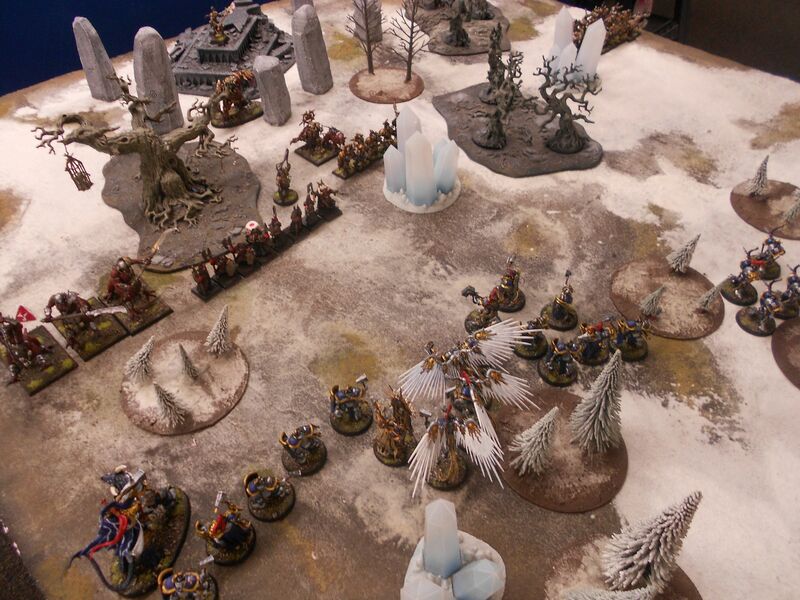 He hoped that his solid infantry in the center would tie up most of the enemy while he smashed through on the left with the prosecutors to stop the abominable ritual. 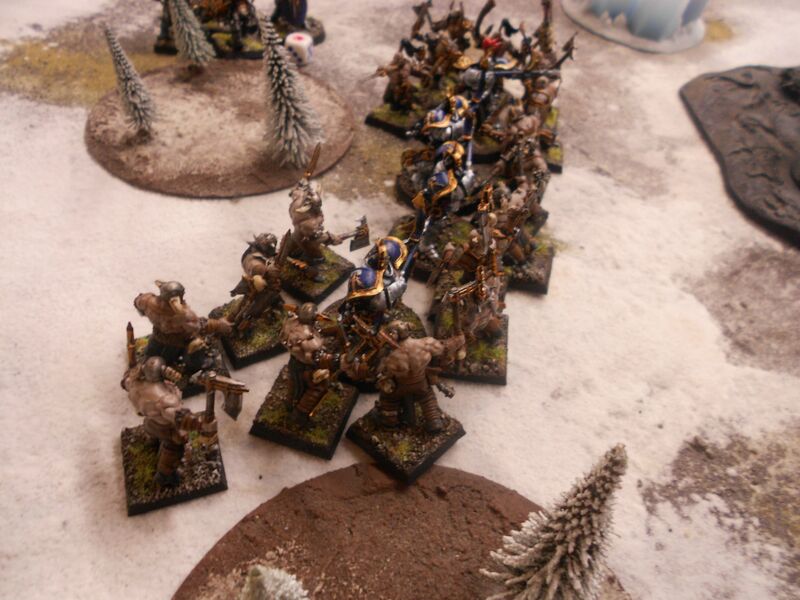 His troops advanced and the Blood reavers on the far left of the Chaos line surged towards them. 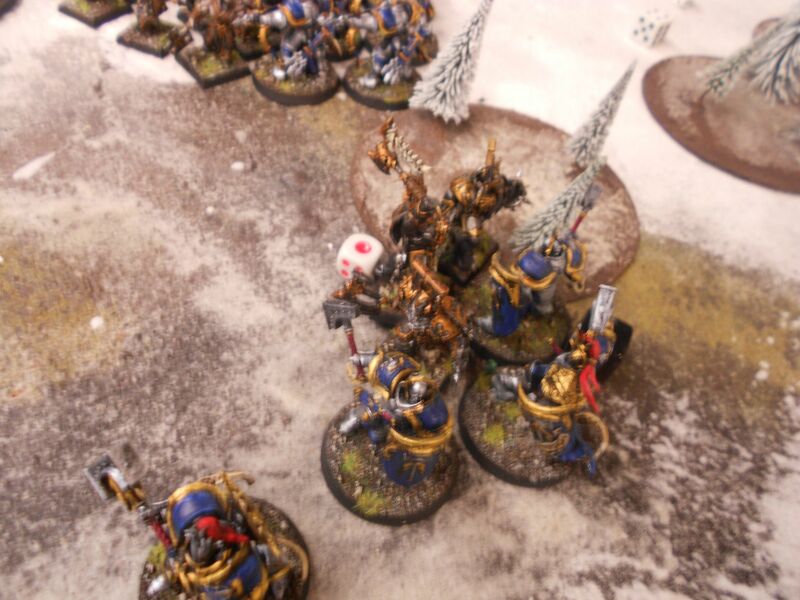 The Judicators moved up and saw Kul himself through the woods and fired on the Chaos lord. Their arrows showered down on him drawing his blood and his ire. 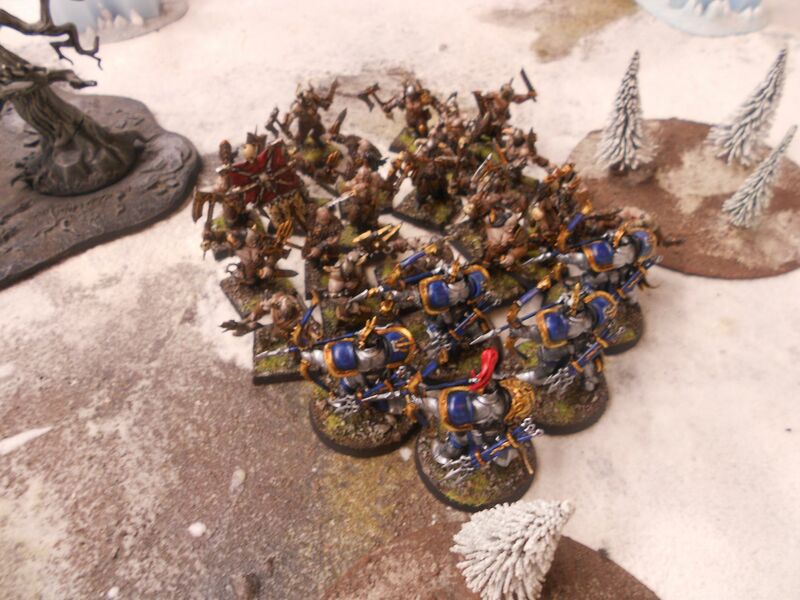 The Reavers charged forward and into them, they took the charge, dropping their bows and drawing their short stabbing swords. 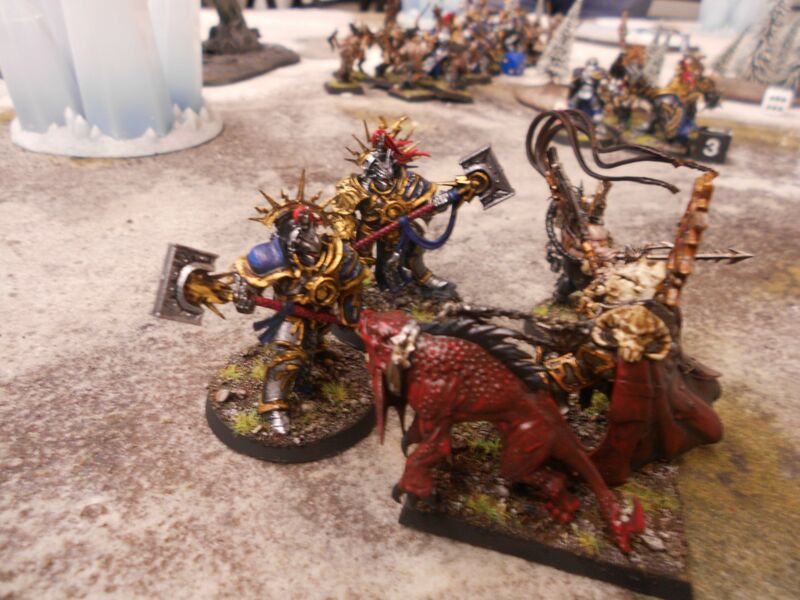 On the Sigmarite the Lord-Celestant saw three Dragon Ogres lurch through the woods and before he could react they charged him, slicing through armour with their glaives like it wasn't even there. He hit back with his hammer and his Dracoth attacked. The fight blew the powder like snow up around them and when it cleared two of the Dragon Ogres lay insensate or dead on the ground and the third one was fleeing. This left the path to the Shrine open with only the Korgorath and the Slaughterpriest standing in his way. The liberators had charged Kul after the archers attack and were tying him up while the Sigmarite forces fought against the Chaos infantry all across the center. 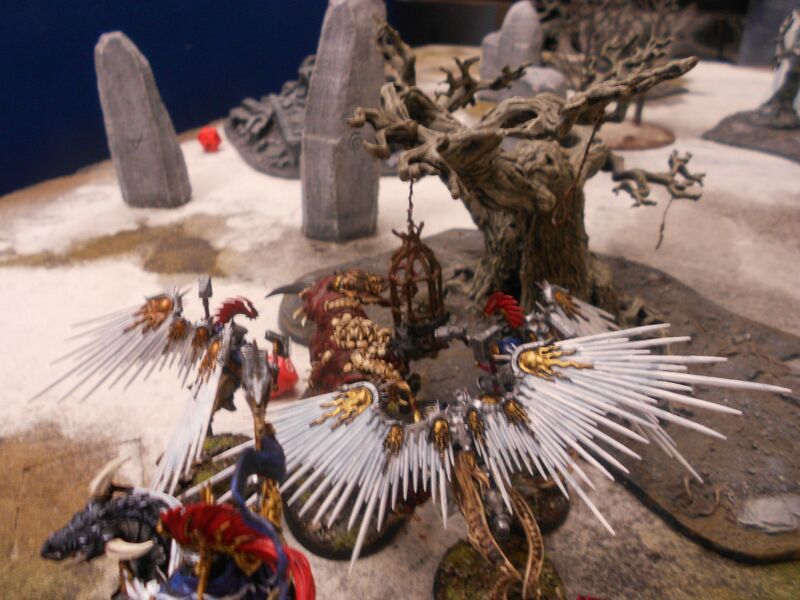 As the Lord-Celestant broke for the Altar the Prosecutors swept in behind him. The hulking Korgorath surged forward and the flying Stormcast Eternals moved to interpose themselves, their leader yelling "Go, Bhartus, end this abomination." Kul slaughtered the last of the Liberators and, his rage upon him, surged forward with his bloodstoker to engage the Lord Relictor, in moments the Relictor was lying on the ground literally torn limb from limb. 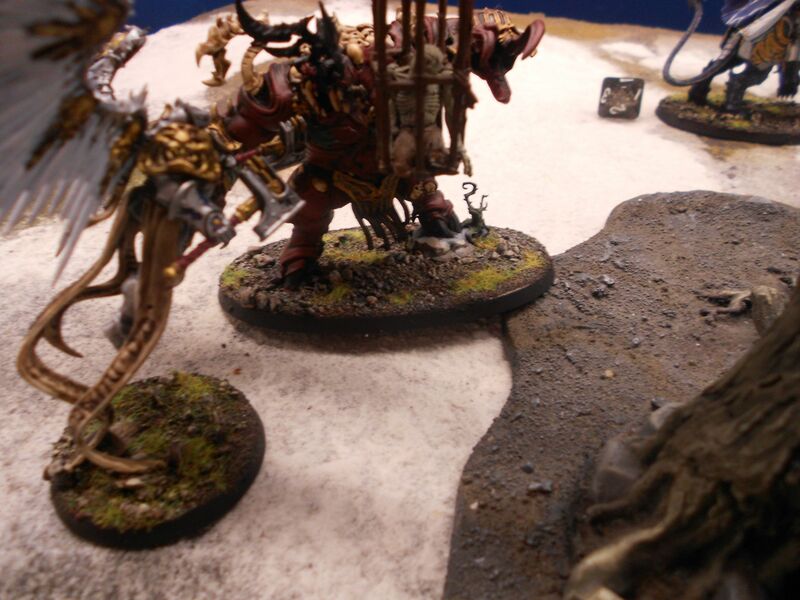 Even severely wounded the Khorne lord was a ferocious opponent. The Retributors moved up to finish him off, after a few quick blows of their hammer the Khorne lord lay sprawled on the ground. 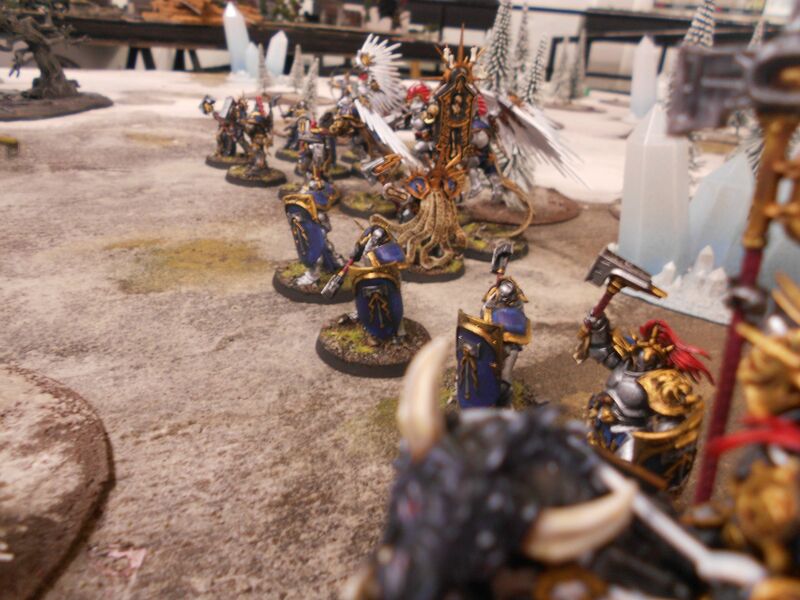 The Judicators were holding their own but the number of Reavers was starting to overwhelm them. 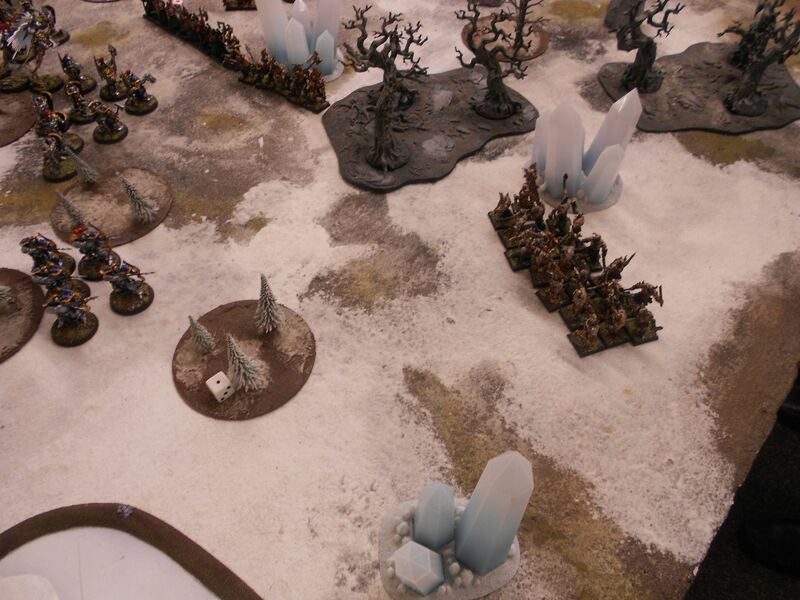 Bhartus moved around the fight between the Korgorath and the Prosecutors. He could see the Slaughterepriest and there was nothing between them. The slaughterpriest kept up his chanting. The Dracoth emitted a searing light from its mouth but the slaughter priest moved behind a column and the light did nothing. Bringing his axe down over his head the slaughterpriest struck the altar cracking the stone. Everything went silent as the evil chanting stopped. The priest looked down and moved back as a huge hand emerged from the split rock. In this game we played the Ritual scenario from pg 163 of the main rulebook. I think this is one of my favourite scenarios. I played a game of it last week and it was a blast then too. Both games were incredibly close. 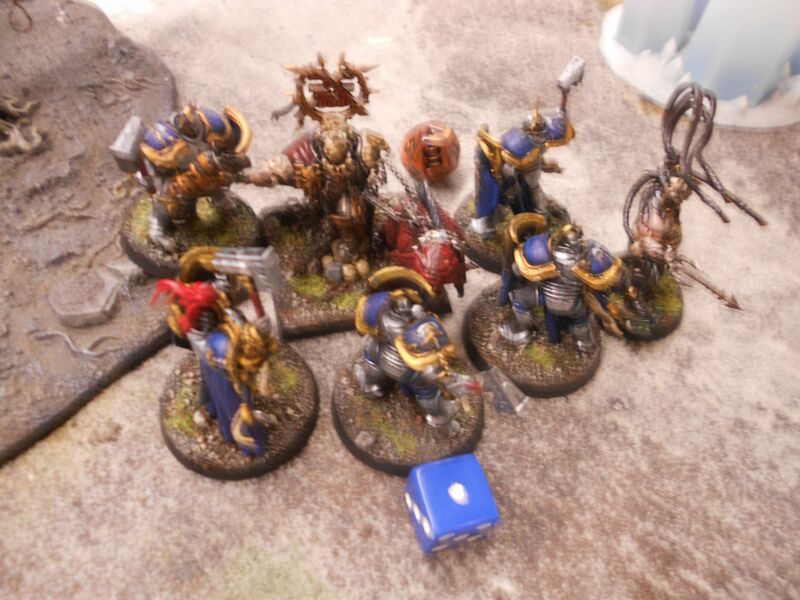 This time the Chaos player was rolling like a fiend for the ritual. You have to get a cumulative 20 pts rolling a d6 every turn. He rolled a 6, then a 5, then a 4 and finished it off with another 6. So only four turns. Still, had he not done that the Slaughterpriest would have been torn apart that turn. All around a lot of fun. Pretty stuff. I'd like to play sometime. Pretty, but too rich for my blood. To paraphrase Mrwigglesworth, "Corvettes are pretty too…but I can't afford one of those either…." You think this is expensive? What I see is a relatively small board, a few terrain features and 2 small … well I can't say armies… warbands, for lack of a better word. I would appraise, price wise, what I see in this AAR as modest at best. Now, contrast that with a 6x4 or better yet, a ping pong table, filled with terrain and REAL ARMIES stretching from one side to another… now your talking money. If folks think this looks expensive, they obviously don't have a whole lot of experience WARGAMING.